Bonami goes on to argue that the violence and unrest of the Sixties was about to deliver itself to the Factory doorstep in the person of one Valerie Solanas. 2. Lonely Christopher’s Death and Disaster Series is an ample, ambitious, riveting and (because riveting) overwhelming body of work, by turns plainspoken and highly adorned. The deaths and disasters alluded to by the title are plainly identified in the text—the death of a mother, the death of a close friend, and the apparently permanent catastrophe of the 1986 Challenger explosion, the photo of which graces the cover of the book. But what interests me is not just the appropriation of Warhol’s title but what is conjured by this allusion, the occult current that runs between Christopher and Warhol, this Death and Disaster Series and its forbear. 3. To begin with: what is Andy Warhol? What can this term mean? On the one hand, this is a figure whose contribution to our visual and linguistic culture is so instrumental that it can barely be summarized, everything from the ubiquitous “Famous for Fifteen Minutes” quote which correctly trendcasted Internet culture to the visual iconography by which such fame is registered—the screen shots, the screen tests, the headshots, the silkscreens which capture not only the images of their subject matter but also glorify the media through which such images pass. On the other hand, Warhol himself has been subjected to every kind of moral imputation imaginable—he looks very hard at race riots, but somehow not hard enough. He himself was a victim of violence and homophobia, yet he is somehow a victimizer, a criminal mastermind. He was affected by mass cultural events but not appropriately engaged by them; a painfully shy gay son of immigrants who hated his face and who didn’t produce the right emotional performances; a devotee of fame who invented a paradoxically public unavailability. To his critics, Warhol did not perform a correct citizenship, a moral ‘self’. His withdrawal doesn’t resemble a Garbo-like via negativa but self-absorption, the narcissism gay men can, according to our heterosexist culture, be relied upon to display. He may like Coke like the rest of us, but he’s not, you know, really like the rest of us. There’s this theory that activist and writer Eve Ensler and I talk about from time to time about people who are living in the world who are alive and people who are living in the world who are dead. Call it a way of looking at human beings that explains death not only as something that stops life in one motion but also describes what people are doing when the engine of wonder sputters and leaves someone stranded and soulless: alive but hollow and strange. We all know people from both sides of the theory: dead people, living people. The worlds that Lonely Christopher makes in this, his debut collection, are all cages, at a time of the world when we really need more stories about people who are shamelessly free—helping people be alive, not letting them be dead. 5. I see a parallel here between Klein’s critique of Christopher and Bonomo’s (more interesting) discussion of Warhol. In both cases, the ways in which these artists interact with the admittedly death-filled and disastrous world is under attack. Klein’s awkwardly coy allusion to 2011 as “time of the world” refers to a world wracked with debt, austerity, drone and analog warfare, environmental collapse, and a general foreclosure of all futures but the virtual, but somehow worthy of just one euphemistic phrase in Klein’s article. The phrase suggests that he knows just how death-ridden our time and world is; yet he blames Lonely Christopher for writing a work which does not put on its Disney ears or flash its TED credentials but instead is absorbed in ‘a time of world’ with its ambient violence, its multiform depredations. You could say that Lonely, as his name suggested, is overly engaged with such a depressing world, engaged in such a way that this critic would not prefer. At the same time, his work could be seen as finding new scales of life (and literary life) within that dead strata. Maybe posthumicity, maybe bare life. Maybe it just doesn’t look or function like the small-world-after-all Klein prefers to know. 6. 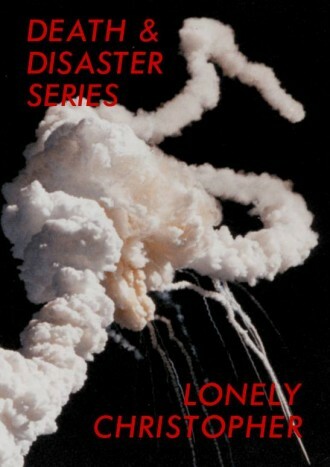 Lonely Christopher’s Death and Disaster Series finds a speaker engaged in a limitlessly vulnerable yet heroically persistent way with the fucked-up world. The volume is made of three long series poems, and the book itself ranges to nearly 200 pages! The tenor of the book is passionate, angry, uncertain, and beauty-driven; the speaker-poet seems to both hate and love beauty, unable to remove it–or its host species, poetry–from his poems. In the first sequence, “Poems in June,” the icon ‘June’ is repeated in nearly every poem or title, persisting and persisting and forcing its way into the poems like poetry’s avatar. then poetry will write itself. June, the force of existence; June, the beauty and the desire to keep making poetry; June the sentence of existence, the life sentence, the death sentence. June where fame happens, June where death happens. June finally forces itself twice into the last line I’ve quoted: the speaker must just say June June. June the true speaker of the poem, June the way of measuring time and the way of declaring time dead, finally June restored to its singular state as people start dropping dead around it: “June/six people shot dead through the/skull on one side of the street I fly […]/in June the sound of the others/there are only three people/three people you can trust.” June can multiply itself and still be singular; around June the bodies pile up. I adore and am infected by the Mayakovskian reach and collapse of this, as well as by the Warholian money-logic of this entire sequence: something is repeated and repeated but not diminished; something else is unfairly, irrevocably zero’d out; grief is turned into a kind of money, that is, into voice; an alternate economy is set up on fatal principles; a June that stays and is cruel; Poetry; money of the dead. but an intelligence, no grade. In this Donne-like space, God and Poetry have the same shape—insatiable form—but it is also a ‘no form’, a ‘no justice’; this poet commits himself to live impossibly at, in, and as this membrane, this diaphragm, this limit. Like Mayakovsky but with a comparable set of loves, Lonely Christopher’s poems are swaggering and besotted, each boast also a plea. love am I born to die? the sweat on a lemonade glass. Lonely Christopher’s new book will be a delight to his fans, a firm but loving scourge to his critics, and a bewitching new flavor for the vulnerable few who seek slim or thickish volumes to clutch to their slim or thickish breasts. Long may he wave.